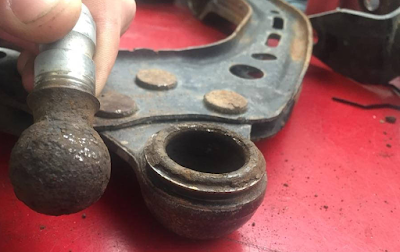 The U.S. National Highway Traffic Safety Administration spokesman Bryan Thomas said they are looking into a potential suspension issue on the Model S after a 2013 owner discovered that his left front hub assembly separated from the upper control arm on a 5 mph drive on a rough road in Pennsylvania with air suspension set to high. The vehicle has driven roughly 73,000 miles since it was purchased. NHTSA has awarded the Tesla Model S a 5-star safety rating overall and in every subcategory in 2013. An inspection by Tesla service center employees discovered that the upper ball joint bolt was loose and caused the wear and tear which they believed was normal, thus it was not covered under warranty. The owner, Pete Cordaro - a "Tesla Ambassador" and two time Model 3 reservation holder - did admit that his car had already many issues "I have a battery replaced, a rear drive unit replaced and now this issue... but I figured I was an early adopter and that came with the territory." However, what was puzzling is Tesla's offer to cover 50 percent of the total repair costs - amounting to $3,114 - for replacing three of the four control arms in exchange for signing a "Good Will Agreement" by the owner, thus keeping the case confidential. Here is the full transcript of Tesla's typical NDA. "The Goodwill is being provided to you without any admission of liability or wrongdoing or acceptance of any facts by Tesla, and shall not be treated as or considered evidence of Tesla’s liability with respect to any claim or incidents. You agree to keep confidential our provision of the Goodwill, the terms of this agreement and the incidents or claims leading or related to our provision of the Goodwill. In accepting the Goodwill, you hereby release and discharge Tesla and related persons or entities from any and all claims or damages arising out of or in any way connected with any claims or incidents leading or related to our provision of the Goodwill. You further agree that you will not commence, participate or voluntarily aid in any action at law or in equity or any legal proceeding against Tesla or related persons or entities based upon facts related to the claims or incidents leading to or related to this Goodwill. " 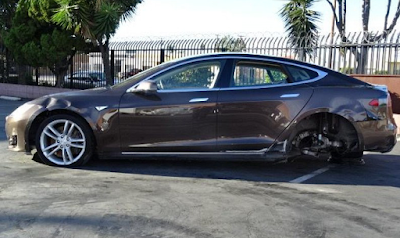 Edward Niedermeyer from DailyKanban has written a whole article detailing the incident, criticizing Tesla for the non-disclosure agreements they have had previous owners sign in the past, and relating this case to other ones when Tesla itself issued a Technical Service Bulletin (TSB) in March of 2015 indicating that a "known non-safety-related condition" applied to the front lower control arm of the Tesla Model S where a "greater free play than expected" can develop in the suspension's steel ball joints, which can ultimately damage the aluminum control arm. Edward and the Model S owner also used Keef Wivaneff's flicker album containing several severely damaged Model S with loose wheels to corroborate the two cases together. However, the case is not that evident as virtually few Model S owners have ever reported safety issues related to ball joints failure and this could be a case of a bad lemon. It is now up to NHTSA to determine if there is enough evidence to escalate the matter. 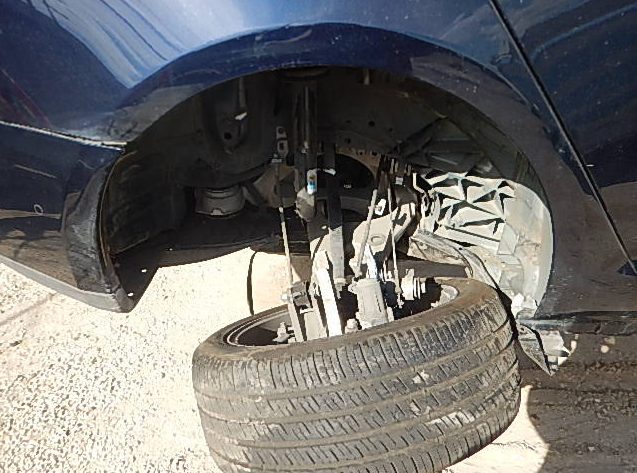 The Model S owner has reported, as of this week, that NHTSA's Defect Investigator Jeffrey M. Price determined - after investigation - that the ball joints "were of poor quality and failed prematurely." Now They are looking to test other similar incidents to see if it is a bad batch at the production level or a bad design. The owner is urging those who have experienced similar issues to save their old parts and present them to NHTSA for testing by filing a vehicle safety complaint at SaferCar.gov. This is by far a very puzzling case and we hope Tesla - or Elon Musk - will shed more light on it if NHTSA determines there is a wide spread safety concern due to quality control failure. UPDATE: Tesla responded to the accusations. Read the full report here. Hi Wayne, of course it is, all the articles are proofed before published. I invite you to read the article in full and click on the links to see the original source of the stories in question.